Thank you to Kate Avery Ellison for providing me with an e-copy of this book in exchange for an honest review!Find this review and more on my blog The Rest Is Still Unwritten!By Sun and Saltwater is the second novel in Kate Avery Ellison sweeping Secrets of Itlantis series and is another beguiling installment that continues to build on the storyline from the first novel and leaves readers raring to dive into the next novel as soon as possible.After the events of Of Sea and Stone, readers find themselves once more following Aemi, who has just discovered that she is in fact an Itlantean, born Aemiana Greywater, and heir of the Greywater family, a wealthy and prominent Itlantean family. With Celestrus having been attacked and destroyed at the end of the last book by their very own people disguised as the Dron, Aemi and a small group of survivors have sought refuge with the neighboring Itlantean land of Primus and have begun to assimilate and partake in Itlantean events. And yet, as Aemi begins to investigate her family’s history she discovers that not everything is as it seems and soon comes to realize that the attack on Celestrus, ordered by Governor Nautilus of the military city of Volcabus, is only the tip of the iceberg and much more nefarious things are happening within Itlantis and only if Aemi steps up can she and her friends prevent a war…. I’m seriously loving this series so far! The first book introduced readers to a really intriguing world, and in By Sun and Saltwater we have the chance to explore it a little bit more, whilst discovering more layers to it. Author Kate Avery Ellison takes readers on an exhilarating journey with this story that is pure entertainment and fun. Her writing was solid, and I very much enjoyed her storytelling; I’m loving following Aemi and discovering more about her and the world of Itlantis.Itlantis is a clearly well thought out world; with positions, politics and the art of deception front and center. I thought the inclusion of the Dron was smart and I’m really interested to see what impact they with have on the continuing storyline. Itlantis is facing its own internal dangers having been betrayed by one of its own, but with the Dron believing Itlantis is attacking them, the possibility of an all-out war is one Ellison makes very clear.Aemi is a great heroine to follow, and I love seeing the story unfold through her eyes. Though months have passed since the events of the first novel, Aemi is still very much the same resilient, young woman she has always been. It’s obvious there’s more growth to be made in her, but already she’s quite capable and willing to stand up for what she believes. I appreciate the fact she hasn’t let her newfound wealth and power go to her head. Of course she still wants answers as to how she came to live in the Village of the Rocks, and why she was taken from Itlantis, but Aemi still seems like the girl we met in the first novel, albeit a bit more confidant and independent.The relationships and friendships Aemi has with the various characters in this series, including Merelus, Lyssia and Tob, remain quite strong. I really loved the new character of Tallyn, an “etiquette teacher” who is so much more than he seems and who keeps Aemi on her toes, and of course I still adore Nol. Nol is a love interest for Aemi, and though there is some developments to complicate their circumstances further, I have high hopes for them romantically. They’re both from different worlds, and spent their lives part of different social standings, but I think they have great chemistry and I’m certainly going to be vying for them in future books.Rich in danger, excitement and mystery, By Sun and Seawater is a great follow up to the first book in this series and leaves me very eager to continue on with the series and join Aemi on her journey once more! This and my other reviews can be found at Amethyst BookwyrmLife in Itlantis has turned out differently from how Aemi first imagined it, with her discovering that she is the heir to the Graywater family and a member of Itlantis high society. However, being one of the elite is not as easy as she would have believed, with Itlantis high society being fraught with rumours and accusations, multiple assassination attempts and she discovers that her father was executed for treason. Desperate for answers Aemi and her friends set off to Arctus, the ice city, but they discover more than they expected. 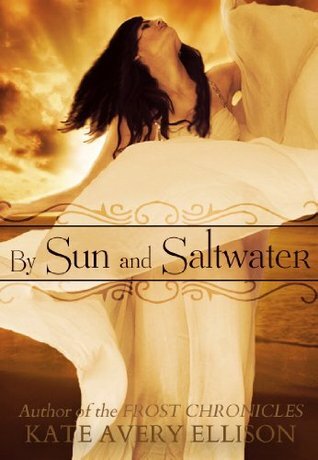 By Sun and Saltwater is a really good sequel to Of Sea and Stone. It has plenty of twists and secrets, and it is fast paced and has action, mystery and romance. I really like Aemi in this book as she has so much to deal with yet she is still strong and kind. There are lots of returning characters including Lyssia and Merclus and another character who I am glad reappears in this book. My favourite new character is Tallyn as he is not all he seems and really cared for Aemi. This book is just as good as the last book and I am looking forward to the next book With Tide and Tempest. I would recommend By Sun and Saltwater to fans of the first book in the Secrets of Itlantis series Of Sea and Stone. Read the book in one night it was very good and once again would make a great movie and I cannot wait for the third one. Intense art 2 This story see the characters growing through more adversity and intrigue. Twists abound and plans are wrecked and boo 3 promises to be epic too. Could have been better...Although in did enjoy this book very much, I'm sad to say it defiantly wasn't as good as the first. (*spoilers*)The first thing that really popped out at me was that the first half was very bland and hardly any progress was made, aemi spent the whole first 50% looking for information about her father and barely came up with anything.The second was nol. I loved their love/hate relationship in the first book, although I think the progression wasn't well laid out, they went from hating each other to randomly liking each other, even though we (aemi) barely know anything about him. However I loved their relationships dynamic so I held out hope for this book. However, this was pretty disappointing. When they're finally with each other again, aemi goes in circles because every time nol makes a comment to the commander to save face she feels betrayed and just keeps going around in circles. And then Nol keeps getting mad at aemi cuz she wants to live with her family, something she's never had before, and live where they were "enslaved" when really they were rescued and although they had to work, it was for a good family. He just seemed to have no sympathy for aemi, she grew up alone without a family and literally has been a slave her entire life, and he's too busy drowning in self pity about the, maybe, one month he got sit around and study. I understand he was upset about his family but every single time he seems to overlook that that is what aemis life has always been like, except WORSE. I'm just really sad because I really liked him in the first book.Ok, now that all of that's out of the way, I loved the book because of secondary characters and the overall idea of this series. Rob and her teacher are what really save this book for me and I'm defiantly gonna read the next one. The sequel to Of Sea and Stone features Aemi coming to grips with her new life in Primus. She sets out on a quest to learn more about her father and why he was framed for treason, all the while dodging attempts on her life. Meanwhile, the Dron aren't taking too lightly to being attacked by Itlantis' rogue military faction.This second book continues the story nicely. There is a lot of great action, mystery, and reveals. I really loved the parts about the Dron and I found Aemi's etiquette instructor to be a really fun character. The story is mostly set in Primus with a little bit in Arctus and some in a Dron territory. I hope we learn more about other cities in future books. The story is Aemi-centric and really driven by her exploration of her past and who is trying to kill her. The senate and politicians in the novel continue to be bumbling self-centered bureaucrats, of which Aemi can expect little help. I really enjoyed this one and looking forward to the next. Another solid book. I expected some of the twists, such as certain people still being alive, but there were a few that actually surprised me. Nothing feels overly contrived yet and it doesn't really remind me of any other books/series that I've read, which is rare considering how much I read the genre. I still have misgivings about the longevity of the series, but good so far! Eh. It was not as good as the first book. Left too many loose ends. I'm sure that's because of sequels. But I kind of got lost in all the political intrigue, family mysteries, and war and missed the wonder of the undersea cities. Haven't decided if I will read the third book or not. Peeling an onion. Kate Avery Ellison is an amazing writer. The story's she writes are so full of layers it's like slowly peeling and onion. I can't wait for the next book to release and be drawn into the characters life's all over again. Let the secrets be uncovered. Great second book from this series. Loved the intrigue and adventure. Many nail biting events and suspense galore. Can't wait to read the next installment! Kate Avery Ellison - I've been making up stories since I was five years old, and now I'm thrilled to be able to do it as a full-time job. I have an obsession with dark fantasy, dystopian futures, and Pride and Prejudice-style love stories full of witty banter and sizzling, unspoken feelings. When I'm not writing, I'm creating digital art, reading funny blogs, or watching my favorite shows (which include TVD and BSG). I live with my geeky husband and our two bad cats in Atlanta, GA.Click here to read the first chapter of THE CURSE GIRL!Click here to read the first chapter of FROST!Attention Book Bloggers ~ If you are interested in interviewing me or reviewing one of my books, send me a message. I'd love to hear from you! (Please note: I am currently not able to fulfill most requests for print copies at this time, but you can always ask. However, I am ALWAYS able and happy to provide e-copies or PDFs of my books in exchange for an honest review. )If you're wondering why I categorize books as "breathless," "cake," or "amnesia," check out this blog post!